NORTHBRIDGE, Mass. —Senate President Therese Murray will be guest speaker at the Blackstone Valley Chamber of Commerce March 7th Membership Breakfast. 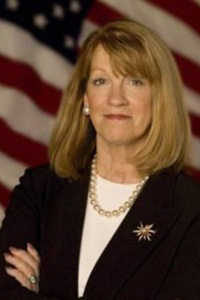 Therese Murray was elected Senator of the Plymouth and Barnstable District in 1992 and became the first woman President of the Massachusetts Senate in March 2007. Throughout her career, Senator Murray has been a driving force behind children’s issues and health care reform efforts, and helped pass landmark legislation including Children’s Mental Health and the Health Care Reform Act of 2006. Murray also co-authored and passed legislation in 2009 to restructure our transportation system; oversaw a comprehensive string of reforms, including improvements in the state pension system, and our ethics, lobbying and campaign finance laws; and in 2010 passed an economic development bill and small business legislation to streamline state agencies, reduce operating costs and create new opportunities for investment and growth. In 2011, Murray continued to lead the Senate’s reform agenda, overseeing legislation to reorganize the Trial Court and Probation Department and establish a transparent hiring process, further eliminating abuses in our state pension system, cracking down on human trafficking in Massachusetts, and authoring fundamental changes in how state government should operate with regard to state finance laws and performance management requirements. Already this year, Murray has led the way in passing legislation to end financial abuses at our education collaboratives and introduced a bill to address the state�s prescription drug abuse problem. Murray also continues to work on health care reforms to change the current payment model to provide better care and bring down costs. Prior to becoming Senate President in 2007, Murray served as Chairwoman of the Senate Ways and Means Committee for four years, where her main responsibility was crafting the annual state budget. Murray’s other major accomplishments include Welfare Reform in 1995; a DSS overhaul in 1997; the consolidation of child care services in 1998; Mental Health Parity legislation in 2000; the Catastrophic Illness in Children Relief Fund in 2001; proposing Smart Growth affordable housing in 2004; Chapter 70 education funding reform in 2006; and a health care bill in 2008 that improves cost reporting and transparency, and promotes electronic medical records and uniform billing. Murray is a 37-year resident of Plymouth and the mother of one daughter. The breakfast will be held from 7:30 to 9 a.m. at Blissful Meadows Golf Club, 801 Chockalog Road, Uxbridge. Cost is $25 for members, $35 for nonmembers. To pre-register only, call the Chamber at 508-234-9090 extension 100 or register online.